AVAILABLE NOW - One Double Bedroom With Fitted Wardrobes - Vaulted Ceilings - Fully Fitted Kitchen With Appliances - Spacious Lounge - Dining Room - Fully Furnished Throughout - Over 45's Park - Pet Friendly with 6 acre dog walking field - No - Private Parking - Garden Area & Shed - No Stamp Duty - Part Exchange Available Subject To Conditions. 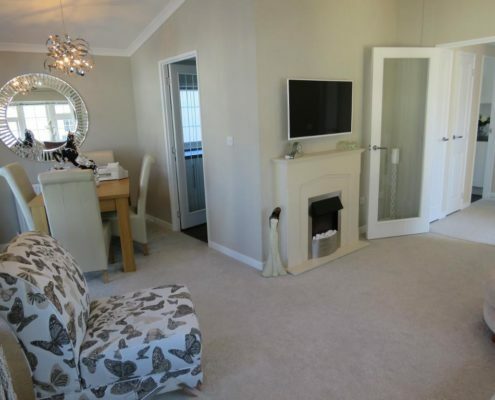 Briefly comprising of the following, one double bedroom, family size bathroom complete with shower, fully fitted kitchen with integrated appliances, dining room, spacious lounge with feature fireplace. 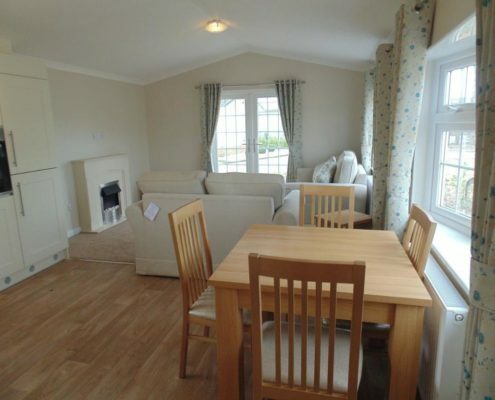 Fully furnished throughout to an exceptionally high standard complimenting the internal design of the home. For further information or to book a viewing, please call us on 01202 770 736 VIEWINGS AND PARK VISITS STRICTLY BY APPOINTMENT ONLY! Park is Pet-Friendly Subject to Conditions Learn more about Omar Residential Park Homes VIEWING STRICTLY BY APPOINTMENT ONLY WITH VENDORS AGENT RIGHT CHOICE PARK & LEISURE HOMES. RIGHT CHOICE PARK AND LEISURE HOMES LTD ARE INDEPENDENT PARK HOME SPECIALISTS WITH OVER 25 YEARS EXPERIENCE WITHIN THE INDUSTRY. FOR FURTHER INFORMATION OR ADVICE PLEASE FEEL FREE TO CONTACT US. 01202 770 736 - 01202 243 138 enquiries@rightchoiceparkhomes.co.uk www.rightchoiceparkhomes.co.uk Learn more about Organford Manor and Dorset Park Homes PHOTOS ARE FOR ILLUSTRATION PURPOSES ONLY - THE FINAL COLOUR SCHEMES AND ROOM LAYOUTS MAY VARY SLIGHTLY. IMPORTANT NOTICE: These property details are believed to be correct yet the accuracy cannot be guaranteed, and do not form part of any contract. The measurements supplied are for guidance only, and intending purchasers must satisfy themselves by inspection. No appliances have been tested or certified as working by Right Choice Park & Leisure Homes. References to the tenure of the property are based on information supplied by the seller. Residential park home for sale in Dorset - 34 x 20 Omar Regency Available - 5 Jasmine Court - 2 Bedroom Fully Furnished Home - New Development On Private Gated Park - Countryside Views - Fully Fitted Kitchen With Appliances - L Shape Lounge Diner With Dual Aspect Windows - 3 Piece Suite - Dining Table & Chairs - Carpets & Curtains - Master & Second Bedroom With Fitted Furniture - Family Size Bathroom To Include Bath, WC & Sink - Patio Garden Area - Parking For 2 Cars - Shed With Power & Light - NO STAMP DUTY OR CONVEYANCING FEES - PART EXCHANGE AVAILABLE SUBJECT TO CONDITIONS. PICTURES ARE FOR ILLUSTRATION PURPOSES ONLY Viewings Strictly By Appointment Only!!! 01202 770 736. Park is Pet-Friendly Subject to Conditions Pet-Friendly Learn more about Omar Residential Park Homes VIEWING STRICTLY BY APPOINTMENT ONLY WITH VENDORS AGENT RIGHT CHOICE PARK & LEISURE HOMES. RIGHT CHOICE PARK AND LEISURE HOMES LTD ARE INDEPENDENT PARK HOME SPECIALISTS WITH OVER 25 YEARS EXPERIENCE WITHIN THE INDUSTRY. FOR FURTHER INFORMATION OR ADVICE PLEASE FEEL FREE TO CONTACT US. 01202 770 736 - 01202 243 138 enquiries@rightchoiceparkhomes.co.uk www.rightchoiceparkhomes.co.uk Learn more about Organford Manor and Dorset Park Homes PHOTOS ARE FOR ILLUSTRATION PURPOSES ONLY - THE FINAL COLOUR SCHEMES AND ROOM LAYOUTS MAY VARY SLIGHTLY. IMPORTANT NOTICE: These property details are believed to be correct yet the accuracy cannot be guaranteed, and do not form part of any contract. The measurements supplied are for guidance only, and intending purchasers must satisfy themselves by inspection. No appliances have been tested or certified as working by Right Choice Park & Leisure Homes. References to the tenure of the property are based on information supplied by the seller. NEW TO THE MARKET AND AVAILABLE FOR IMMEDIATE OCCUPATION! L Shape lounge diner with feature fire place and dual aspect double glazed windows and french doors which lead out onto a large decked area with field views. 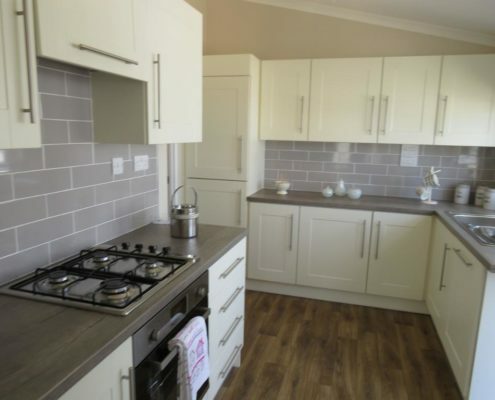 Fully fitted kitchen with appliances and the bonus of a separate utility area. The hallway has storage cupboards, and a cloakroom with WC and Sink. Large double bedroom with walk through wardrobe area into large ensuite which has a bath, over bath shower, vanity sink unit and WC. Outside there is parking for 2 cars a small courtyard area, and shed with power and lighting. Viewings Strictly By Appointment Only! 01202 770 736.